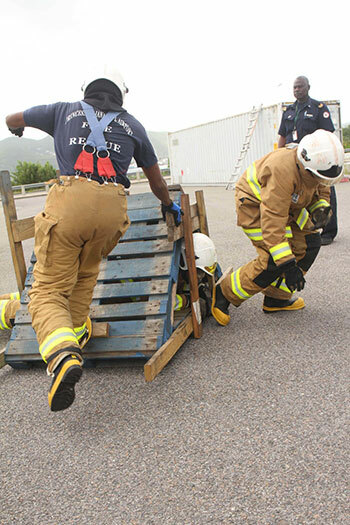 SIMPSON BAY, St. Maarten (Wednesday, July 23, 2014) - What was initially meant as a competition took the form of a demonstration of skills and fitness as members of the Princess Juliana International Airport, SXM, Rescue and Fire-Fighting Department continued the celebration of Firemen’s Week with an obstacle course on Wednesday, July 23, 2014. According to Manilo Penijn, manager of the department, the change to more of a demonstration style was made so that onlookers could get a better understanding of the tasks being performed by the fire fighters. This resulted in a test of teamwork as opposed to a competition. Penijn attributed the slight modification to wanting those in attendance to learn more about the daily routine of the fire fighters. The obstacle course mimicked what fire fighters would have to be prepared for in the event of an emergency. This included expeditiously donning their fire gear, rolling out fire hoses, assembling and disassembling suction hoses, climbing a ladder and shooting water from the crash tender toward a specific target. 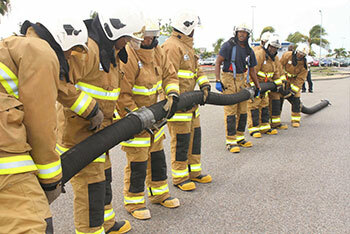 SXM Airport firemen attending to fire hose sections during the public demonstration at the airport for Firemen’s Week 2014. As the fire fighters executed the obstacles, MC Les Brown explained the importance of the techniques involved. The fire fighters’ strength was also tested using a keiser sled, which is a simulated forcible entry-chopping device that provides an efficient and durable means of testing fire fighters using sledgehammers. The obstacle course also included dragging a 200-lb pound dummy for a specified distance. The hour-long event kicked off around 10 AM and was attended by airport employees, and members of the airport community such as handlers, security workers and some concessionaires. The crowd often applauded as the firemen completed the obstacles as a team. Overall, the fire fighters did an exceptional job in full fire gear during the warm morning hours and were equally pleased with the outcome of the event. Some noted that the obstacle course was a lot less challenging than what they have been trained to face. 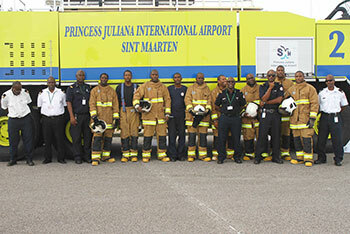 Deputy fire chief, Damian Cooks, said that the men “displayed excellent skills.” The event was well received by the airport staff and airport community in attendance, who along with the fire fighters, were treated to breakfast under the canopy (East entrance of the terminal building), following the event. Penijn said the event had gone very well, and the R&FF Department is looking forward to the remainder of this week’s activities. “We couldn’t have asked for anything better,” Cooks concluded. On Thursday, there will be free glucose and blood pressure testing for everyone at the airport while the week’s activities conclude on Friday morning with a special Fireman’s Certification & Ranking Ceremony starting at 11AM.